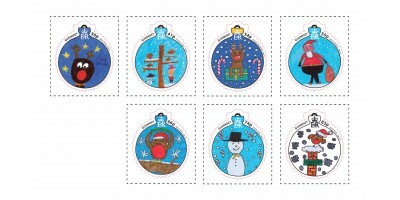 Stamp Descriptions 36p - Rudolph and Stars41p - Robins in Trees54p - Rudolph and Candy Canes55p - Jolly Santa66p - Round Robin74p - Snowman and Candy Canes83p - Robin on Chimney Our sets are supplie.. This stamp issues isproduced in sheets of nine. This enables collectors to obtain cost-effective sheets of each value with the name of the designer, printer and printer’s information and ‘traffic li.. 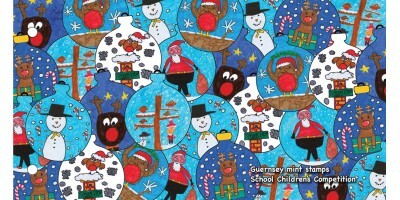 The wonderful images featured on Guernsey Post’s 2014 Guernsey and Alderney Christmas stamp issues have all been created by local schoolchildren in the islands. 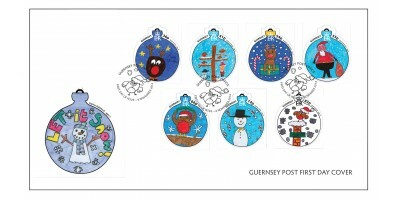 Working closely with the schools, the Philatelic team at Guernsey Post presented a special competition idea, which meant the youngsters had to get creative and begin thinking about the festive season in early springtime! The competition helped to introduce the children involved to concepts of design, composition, use of media and techniques, as well as collaboration and working to a deadline. 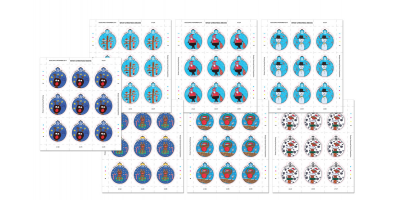 The level of entries exceeded expectations and the overall standard of the designs was superb; the resulting stamps form a truly charming Christmas collection.